Many of my consultation clients want foundation or garden plants that don’t require constant pruning. They are tired of fighting a losing battle with plants that want to grow tall. 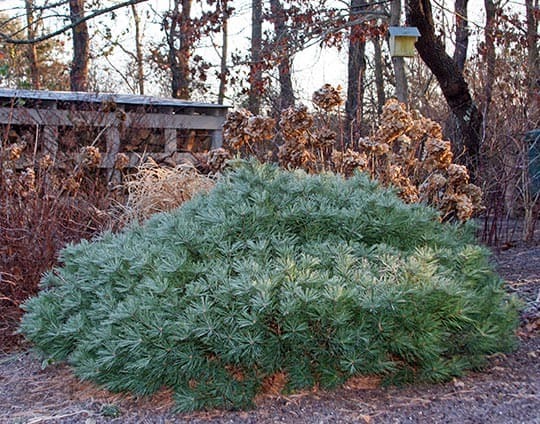 For many of these customers I recommend Pinus strobus ‘Minuta.’ The Minuta white pine is a dwarf evergreen that has bluish green needles and only grows to about two feet tall. Dwarf conifers have a habit of being very small and tidy in their youth and a bit more exuberant in adolescence. Parents of teenagers can relate. So although some photos of the Minuta pine show it as a tiny, round ball, know that in a few years it will grow a bit more loosely. My Minuta is ten years old and it’s just over two feet tall and four feet wide. My guess is that it will continue to grow wider. Great texture, wonderful color, and hardy in zones 3 to 7, this short shrub is perfect for areas where you want a carefree plant that looks stylish twelve months a year. Grow this plant in sun or part-shade…I’ve grown it well in a yard that only had three hours of mid-day sun, and now I have this plant where it receives four to five hours of mid to late afternoon sunshine. In both locations it has thrived. Every home landscaper should strive for a yard and garden where they are not fighting the size their plants want to be. Since pruning usually stimulates growth, trimming shrubs is a make-work project for the homeowner. Less work for the gardener? You Can Grow That! Here is my Minuta pine on a frosty December morning. I love this plant!